It is said that good things come to those who wait. So, after a gap of 25 years, a Summer Show has been resurrected in the pretty Staffordshire village of Edingale. A small group of hard-working volunteers in the village, which lies a few miles from the historic market town of Tamworth, have decided to re-start the show after an absence of a quarter of a century. The aim is to provide traditional village entertainment and also to raise money towards refurbishment of Edingale Village Hall. Among the entertainment expected on the day is a Dance Show, a barbecue, Tug-of-War display, and a Rounders competition, plus live music throughout. 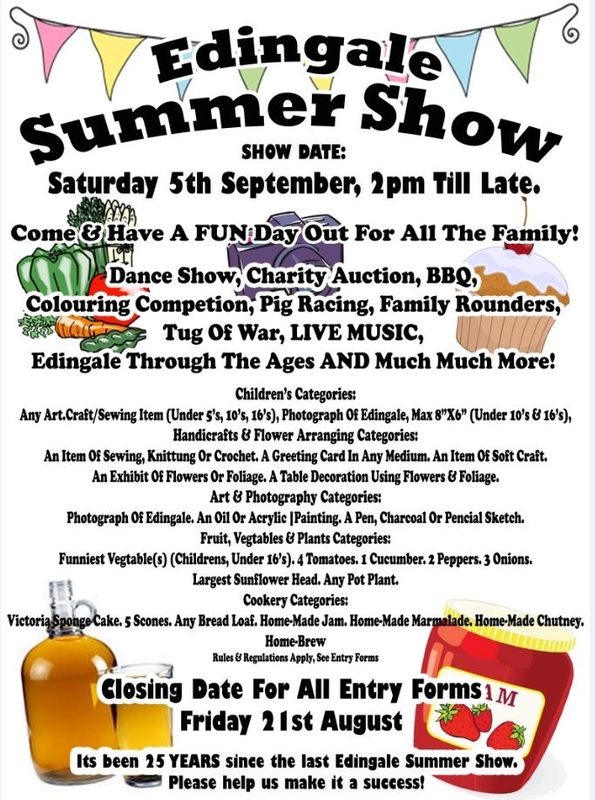 People from within the village and surrounding area are now being invited to enter one or more of the various classes, while also enjoying a great day out for all the family on Saturday 5 September, starting at 2pm. For the younger participants there are special children's entries which range from art and craft and sewing items to photos of Edingale. At the same time, there are a wide range of adult entries to tempt people into becoming creative. These consist of handicrafts and flower arranging; art, including oil or acrylic paintings and pen, charcoal or pencil sketches, plus photographs of Edingale; fruit, vegetables and plants; and cookery, ranging from Victoria sponge cakes and scones to home-made jam, marmalade or chutney, and also home-brew. The entrance fee is 50p per entry. All entries will then be auctioned after the show, unless the organisers are notified in advance, in which case the entry fee for non-auction entries is £2.